Inogen One is a respected Medical DME company that manufacturers the Inogen One Oxygen Concentrators. Based in Goleta, California, Inogen One manufactures their oxygen concentrators in the USA. Accredited by the Accreditation Commission for Health Care (ACHC), Inogen One has an A+ rating by the Better Business Bureau and received the Gold Award in Medical Design Excellence for the Inogen One G2 Portable Oxygen Concentrator. The Inogen One was one of the first portable oxygen concentrators allowed by the FAA on commercial airlines. In addition to being a light 7.25 lbs with the battery, the Inogen One G2 has five different flow settings that gives the patient greater control of the oxygen flow. Inogen One now offers a new smaller Portable Oxygen Concentrator that weighs only 4.9 pounds with battery. 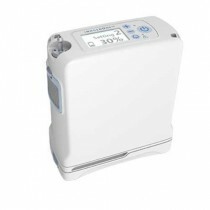 This oxygen concentrator, called the Inogen One G3, offers an 8 cell battery with 2 to 4 hours of operation and/or a 16 cell battery that operates for 4 to 8 hours. Air Purifier/Humidifier: Air purifiers are designed to prevent lungs and air passageways from becoming irritated. By utilizing a filter or ionized surface to pull dust and micro-sized particles from the air, air purifiers also contain the potential to eliminate odors. CPAP: CPAP machines are indicated for the treatment of sleep apnea. Vitality Medical carries a wide variety of CPAP, Bipap and VPap machines and accessories to suit a wide variety of different needs. Nebulizers/Compressors: Nebulizers are used for respiratory therapy and come in two different styles: Piston Nebulizers and Ultrasonic Nebulizers. Portable and pediatric models are also available. Breathing Therapy: Vitality Medical carries a wide variety of different types of breathing therapy products, including cough assist machines, spirometers, peak flow meters and respirators. Oxygen Concentrators: Also referred to as oxygen machines, generators and compressors, oxygen concentrators provide a cost-effective way for oxygen therapy patients to supplement their oxygen needs. An oxygen concentrator pulls-in regular room air while filtering out some of the other gases present. Tracheostomy Supplies: Tracheostomy supplies are medical devices used for stomas on a patient's airway. Trach supplies offer a convenient, comfortable lifestyle for people who have had a tracheotomy. Trach supplies assist with breathing by suctioning bodily fluids from an individual. November 2012 - Inogen One G3 obtains approval from the FAA to be used aboard commercial aircraft. August 2011 - Inogen One acquires Breathe Oxygen Services (BOS). BOS is a homecare respiratory services company near Nashville, Tennessee. August 2011 - Inogen One obtains a federal supply contract to provide portable oxygen concentrators to federal agencies and patients served by the VA.
June 2011 - Inogen One Oxygen Concentrator awarded Medical Design Excellence Award for its oxygen therapy device.